As most people in the states were sleeping in, anticipating beer, friends, and fireworks, I was scrambling over piles of black basalt ruins in the desert near the Syrian border. The ruins of Umm al-Jimal seem to stretch on forever, black against blue sky and gold sand. Our group of nearly twenty rapidly dispersed across the site, no other tourists in sight. Indeed, when we drove into the tiny parking lot there was not another soul around, and we crossed the road and filed in through the open gate. Umm al-Jimal was founded by the Nabateans then occupied by the Romans who used it as a military post. The site has been excavated, but the reports are sadly unpublished. 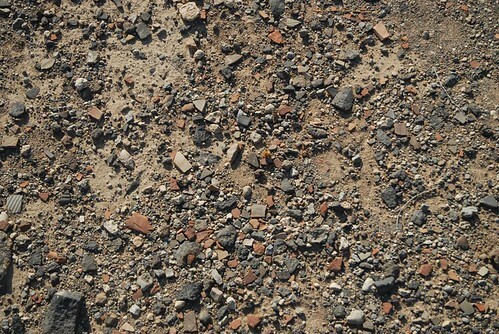 Acres and acres of archaeology remains, and there are bright red Roman pot sherds covering the ground. I walked along the top of a wall with my friend Alan and ducked inside the structures with still intact ceilings—basalt blocks that looked like they had been woven together—an architectural marvel that defies lofty ideas of reconstruction. Would we have been able to figure out this kind of complexity from a jumble of stones? My thoughts went back to Dhiban, to my own pile of rubble. Umm al-Jimal was the last stop on a weekend trip that included Jerash, Umm Qais, and Qala’at Ar-Rabad. Jerash is the famous site, fabulously reconstructed limestone Roman ruins with gladiator fights, chariot rides (I got the reins taken away from me when I made one horse shy, booo) and a view of the modern city. I walked up the long Cardo Maximus and up the stairs to the temple of Artemis, snapping photos of the spare columns against the blue blue sky. Artemis always seemed like a sensible goddess to me, not as silly as Aphrodite or as stern as Athena or as vicious as Hera. The Eastern Artemis was different though, with mysterious spheres hanging from her chest—breasts, testicles, something else? It hasn’t been decided, so said Danielle the Classics prof that chatted to us about the streets and arches that we wandered through. The midday call to prayer was followed by live broadcast of sermons from the surrounding modern town, and the Arabic wound down and around the Corinthian flourishes and faceless lions. The next stop was Qala’at Ar-Rabad, a castle built to defend against the pesky Crusaders. It’s become an especially dear to the immigrant Palestinians who have re-settled in Jordan and long for a glimpse of their homeland from its ramparts. They’d line up to take photos of their loved ones against the distant horizon and I tried to stay out of the way. I loved the architecture, full of built and re-built walls, arrow-slits, and mysterious feats of creative reconstruction by well-meaning conservators. After a good night’s sleep (!) and a blessed hot shower (!!) we made our way to Umm Qais. We’ve been having a hard time getting a bus that will hold us all, so we spilt into four rental cars, silver non-descript sedans dressed up with neon pink flagging tape so we could keep track of each other. The rides were long and hot, static Persian pop on the radio, idle chatter about archaeology and school and miscellaneous. Umm Qais is another Roman Decapolis, mentioned in the book of Matthew in connection with a rather silly story about evil spirits possessing people and Jesus casting the spirits out into a herd of pigs who then rushed into the Sea of Galilee to drown. To enter the site you traverse a ghost town of Ottoman houses that were contentiously evacuated to allow for more work on the “important” Roman architecture. Happily most of the houses are still standing, and I enjoyed a few good mezzes, a cold beer and an outstanding view of Israel-occupied Golan and the mountains of Lebanon after my long walk through the ruins. Umm Qais is a mixture of blinding white limestone and black basalt, a breathtaking contrast set in quiet olive orchards. The government was excavating a large plaza, column sections lined up and numbered for reconstruction, their Corinthian caps sitting askew like bleached vertebrae from a long-dead leviathan. Most people think that all the Roman ruins are excavated, but there are thick, fat acres of olive orchards at Umm Qais, pregnant with archaeology, bits sliding out of poorly-executed sections. This was true at all the sites we visited—Ben likes to say that there’s dozens of dissertations at Umm al-Jimal alone. We ended the trip by flying down highway 15 out of Mafraq, cutting in front of the other cars, trying to get back to Dhiban in time to do our laundry. We got into Amman just as the sun set, the fading light turning the blocky concrete houses into a hilly moonscape, jagged satellite dishes, terraces, rebar jutting geometrically into the skyline. I was happy that Dave was driving, a wry Scouse who was quick and precise behind the wheel of our silver rental car. The story just gets silly and complicated from this point on—ruins behind us, we got kicked out of ACOR (American Center of Oriental Research), went on a hike to get food and beer, and didn’t get back to site until midnight. I should update again about my barrel vault (oddly single? truncated floor? bin in the south side? ), but I think it will wait for a few days.